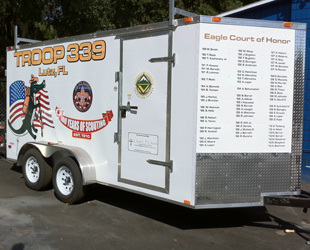 Our variety of tailored vehicle graphics offers you a vast array of choices when you're ready to take your marketing message to the streets. From basic lettering to full vehicle wraps, we have a number of effective, eye-catching options to get you and your business recognized. Advertising your business throughout the community is now as simple as taking a drive to the grocery store or picking the kids up from school. Simply come in and let us print and apply one of our top-notch vehicle graphics to your car, truck or van and start spreading the message. A vehicle equipped with one of our graphic applications has the potential to garner 160,000 impressions - or looks - in a single week. That's 8 million glances over the span of a year! 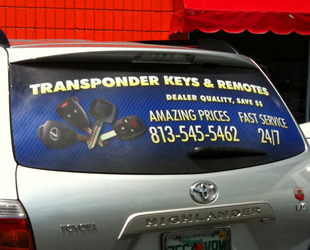 Research has proven that the use of vehicle advertising can garner 13 calls from new customers on a weekly basis. That's 676 new customers in a year's time. If each of these new customers was to purchase a minimum of $20.00 worth of products and/or services from your company, that would be additional revenues of more than $13,000.00. If each of them was to buy $50.00 worth of products and/or services from your company, that would equate to more than $30,000.00 of additional income in year's time. 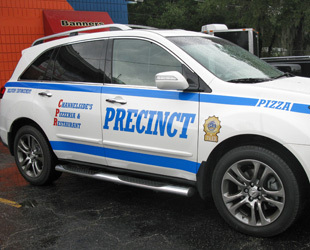 Our state of the art design software and printers allow us to produce superior, cost-effective vehicle graphics quickly, so you can get your roving marketing campaign underway in virtually no time at all. The vast array of colors and finishes for vehicle graphics that we offer crosses the spectrum in variety, which enables you to explore an infinite number of vibrant, muted, metallic and matte possibilities when approaching the design of your vehicle graphics. And with our team of printing specialists, your options are practically limitless. 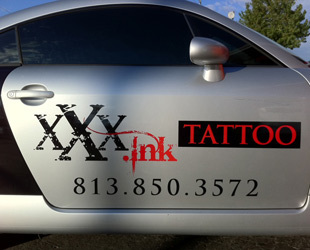 Come in with a design of your own or let one of our trusted graphic designers create some vehicle graphics for you. Our staff of experienced artists, printers and marketing specialists can help you create the vehicle graphics that get you noticed. Whether you're looking for a stylish layout of vinyl lettering or a full-sized graphic scheme that encompasses the entire passenger side of your car, truck or van, we are equipped with the skill and technology to get your mobile marketing plan in motion. You work for your vehicle (i.e., car payments, insurance, oil changes, gasoline, etc.). Now make your vehicle's graphics start working for you. It's been said that a good business is dependent upon location, location, location, but, in today's marketplace, it is all about visibility, visibility, visibility. And now there's no easier or more convenient way to make an impression upon the potential customers living in your community. 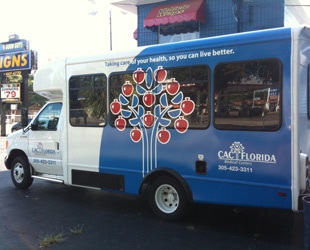 Make yourself visible, and get noticed with one of our high-quality, affordable vehicle graphics. 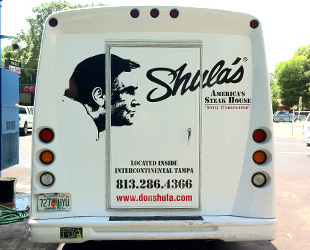 We offer vehicle graphics in Tampa, Florida as well as St. Petersburg, Clearwater, Largo, Palm Harbor, Brandon, New Port Richey and through Tampa Bay.